This week a very nice parcel arrived from Amazon containing a book I had discovered by accident but wish had found it sooner - Plantsman's Paradise: Travels in China by Roy Lancaster. As many will no doubt be aware Roy Lancaster is well known gardening "personality" in the UK but has also travelled extensively collecting some fantastic plants. We have a number of Roys introductions in our own garden, some of which we hadn't realised until recently were introduced by him. Plantsman's Paradise is a second edition of the book, first published in 1989, but given a substantial update with full colour images and updates to plant nomenclature and information on introductions to plants into western cultivation. However the tales of the various expeditions detailed in the book have remained unchanged. Some places Roy travelled to have now been lost forever, such as the Yangtze Gorge which has since been flooded. The hundreds of full colour photos are a beauty in themselves, and it is rather enjoyable to spot plants we are growing in our garden described and photographed in their natural location. 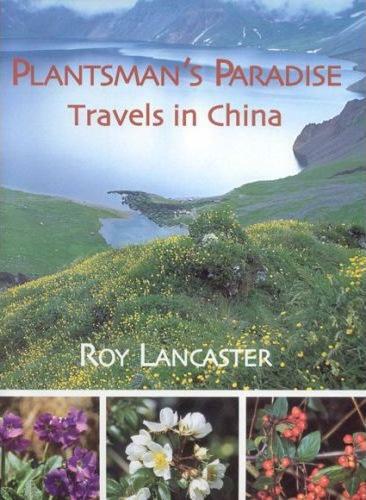 Whilst I have so far only dipped into the 500 pages of travels and photographs I can recommend this to anyone with an interest in the plants of China or just traveling in the country itself. Mark and Gaz, this book looks interesting and a must-have for some people. I would like to look at it, as I'm sure others would. Why don't you use your good writing skills to review it at reviewsbynellie.blogspot.com? I'm trying to get a wide variety of types of books on there before I try to really publicize the blog. Plantsman's Paradise seems like a good addition. Dear Mark and Gaz, As you say, Roy Lancaster is a highly knowledgeable and, yet, accessible plantsman. He has an infectious enthusiasm for plants which he conveys in a genuine and unaffected way. I do not have this particular book of his but I am certain that it would be a good read as well as highly informative. I agree Edith. He's also one of the best presenters to have ever graced GW, and do enjoy the occasional article he writes for the RHS. I miss Roy Lancaster and many of the other greats which at one time were regulars on our screen. To quote what The Patient Gardener said a while back, we have gone from an over load of garden make over programmes to now being almost forgotten about. You guys mentioned Gardeners World a little while back, my wife said that she heard a report that Monty Don was taking over once again. Noel - I'm sure you would enjoy this book. Alistair - I had read that Monty was coming back for the new series in the Spring. I must admit to not being a Monty fan, although he is very enthusiastic for his particular interests (just a bit too much veggies for me). However the Round the World in 80 Gardens series he presented a couple of years back was very good, so much so, the DVD is a regular in our house. I love the way Roy writes about plants, I bet this is yet another winner. Such a knowledgeable man, and so enthusiastic and willing to share that knowledge. Must be wonderful to gain new insight into plants you have in your own garden.